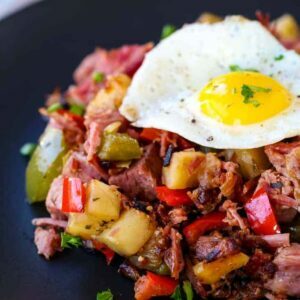 This corned beef hash recipe isn’t just for breakfast! Use your leftover corned beef from St. Patrick’s Day, or grab some sliced corned beef from your deli! Melt the butter in a large cast iron skillet over medium heat. Add the diced potatoes along with the salt and pepper and stir to combine with the butter. Let the potatoes cook, stirring occasionally, until browned on the outside and tender, about 8-10 minutes. Add the peppers and onions to the potatoes and cook for another 5 minutes. Add the corned beef, Worcestershire sauce, soy sauce, Italian seasoning and garlic. Stir then flatten into a single layer in the skillet and cook, without stirring for 3-4 minutes so a crust forms on the bottom of the hash. If you’re cooking the eggs in the hash, make 6 wells into the hash and crack the eggs into the center of each well. Place the skillet in a 400 degree oven for about 5 minutes until the whites are set and the yolk is cooked to your desired consistency. Alternately, you can cook the eggs in a separate skillet and serve on top of the hash. *If you’re using the oven method to cook your eggs, preheat the oven to 400 degrees before starting the hash.